Create a Website, Post a Blog and Let the World Surf it. Time has changed, a new world is emerging and media is rapidly reshaping society. Digital technology has long revolutionized old systems and methods and it continues to explore limitless horizons. Today, I can’t imagine reprinting my legacy black and white negatives using my old darkroom enlarger and dissolving double weight photo papers in a tub of developers and acid fixers. Instead, I can scan my negatives in a flatbed scanner at high resolution and save it as either jpeg or tiff (depending on your preference) digital files and later reverse it into positive using Adobe Photoshop. Without having to soak my hands in chemicals, I can later print my image at a high resolution of 300dpi (dot-per-square-inch). In fact I don’t even have to print my image on paper if I want to share it for everyone to appreciate. I can upload this content or file through the internet and post it for everyone who wants to download for that makes me a content creator – and so with anyone else. Mobile telephones has also changed the way communicate. We do not only use the cellular or celfon to converse with one another but we also use it to capture images and record sounds. Depending on the band width, capability and service provider of the unit, it can also transmit a gallery of text messages, images, movies or sounds through digital satellite services. Just like mastering photography, being computer literate is a never ending process. Computer programs and softwares are upgrading faster than the operating systems of desktops, laptops or palmtops. Before you are able to master another authoring program, new ones are invading cyberspace and before you knew it, your eyesight are getting worse and your workroom have accumulated dusts and funny of it all - people will call you a geek or a nerd. After IT Superhighway and Cyberspace comes now the world of blogosphere or whatever digital village that is nowhere to be found in the global map. Blog or web log is an online conversational medium that caught my curiosity just a year ago and it is fast gaining ground as an alternative to an email or even a webpage. Its persistence in cyberspace is a clear example of the democratization of media in both creation and distribution. Many photographers have translated the language of their art into new web-based opportunities. Photographic journals that chronicle practically anything from family vacation to Pulitzer eligible stills are now posted online giving photographers a place to present their work without the intervention of a publisher or a curator. Sly Quintos, a friend of mine who hides under the name DejaVu posted his digital images as a camera enthusiast and he is now the top contributor of www.imagesphilippines.com. To prove that e-commerce can work with obscure and unknown photographers like this writer, I received a call from the administrator of imagesphilippines telling me to send a high resolution hardcopy (in CD) of my photo to their business address in Makati because a client wants my image for a corporate calendar. After a week, I received a bank transfer and I never cared where my image ended up to. Now, who says that nerds and geeks can’t do e-commerce? Going Abroad?.... Know What Not to Bring. During my travel to the US and Canada after the eventful 911 tragedy, airports including our very own NAIA have intensified their security measures to a point that almost every bits and pieces that a traveler carry are thoroughly checked and scrutinized. In 2004, I learned from an email group portal that a Filipina who just passed her nursing here was immediately deported by immigration officials at a US terminal upon inspecting from her luggage pages of photocopied CGFNS reviewer originally published in the states. Carrying pirated DVDs, VCDs, audio CDs, softwares or computer programs is strictly banned all over and this has caused the deployment of media forensic experts in many points of entries worldwide so that fake items can be immediately be checked. As of this writing, I am not yet sure whether powerpoint presentrations in CD-ROM or optical media authored by a person other than the traveler are allowed at airport terminals without a written consent by its creator. "Content Creator" is a term or title used to identify the authors of the disc's contents. In my case as a multi-media artist, I authored and "burned" my own powerpoint and video presentations into compact disks (CDs) and digital video disks (DVDs). Confident that my name appears in the file properties of my presentation as inscripted by my working software, I wonder if media forensic experts will go to the extent of verifying the true authors of such materials. A question can also be raised with the mass use of USB flash drives or portable storage devices nowadays. These solid state media are small enough to be concealed in small bag pockets or used as a key chain. One or two gigabyte of storage capacity of a flash drive can accommodate as many files as that of two to five CDs. The Philippine's Optical Media Act of 2003 states that t he Optical Media Board shall prescribe source identification codes or SID codes for all persons, establishments or entities authoring and mastering optical media. As for me, I'm not yet sure whether to secure one since I haven't heard of someone having such. I also see a grey area from the provisions of the Act when it comes to USB drives. Since it is always best to be sure, one should not carry a drive with copied contents especially original movies from Hollywood. Hawai'i Consul General Ariel Abadilla whom I have met during my cultural diplomacy as ethnographer-in-residence at the East West Center issued a warning to Filipino-Americans there that visiting relatives carrying pirated items can spoil and jeopardize their travel. Abadilla also reported that the US Embassy's Consular Section recently received a report that the US Department of Homeland Security (DHS) searched the bag of a Filipino on NW 72 in Detroit. During the said search, 70-80 compact discs, 30-40 empty DVD jackets and 10-20 DVDs were found. Abadilla added that since the travelers were not American citizens, their visas were cancelled and they returned to the Philippines. Had they been Americans according to Abadilla, they could have been subject to arrest and criminal prosecution in addition to civil fines and penalties. When I went to Honolulu this February, I actually brought three Ilocano Karaoke VCDs and I saw to it that it bears the hologram of the Videogram Regulatory Board which is now the OMB. To ascertain that my travel to US is trouble free, I even carried with me the receipt of the VCDs. My Friend Gabby Ruliva of Pinsao, a retired US navy felt sorry to his relative who refused to carry a DVD containing my coverage of the successful 2006 Lang-ay Festival in Bontoc for fear of a possible problem that they might encounter upon reaching a US Terminal. By the way, traveling with a laptop with an unlicensed operating system (OS) like the latest Windows XP and upgrades may also pose a problem so think again before bringing an item out of the country. Note: I have lifted this story written by Jane Cadalig for Sunstar Baguio to provide a local news angle about Marky Cielo during the last Lang-ay festival in Bontoc. Thanks to Jane and Sunstar. Art Tibaldo. Photo shows Marky with Linda Fines of DOT, Peachy Versola of DOST, Inah Felice Tibaldo of UBSHS and Jonalyn Ponciano of PIA-CAR. MARKY Cielo, the recent winner of GMA-7's top-rated talent search and one of the most celebrated personalities in the entertainment industry today, has been asked to adorn this year's Lang-ay Festival in Bontoc, Mountain Province on April 6-8. Provincial Administrator Paulo Pagtielan said aside from requesting Cielo to attend the festivity, they are also crossing their fingers that this year's second staging of the Lang-ay Festival would bring in tourists, not only from the Cordilleras, but also from other places in the country. Pagtielan, during Thursday's Kapihan media forum, told reporters that GMA-7, one of the country's largest television networks, has confirmed Cielo's participation in the festival. He said everything is already in place for this year's festival, which was first conducted last year in a bid to promote the province's tourism industry. Cielo, 20, who hails from Bauko, Mountain Province, is the second Cordilleran to enter show business. Pagtielan said residents and supporters in the province exhausted all effort to ensure Cielo's triumph. He narrated that they repeatedly encouraged residents to support Cielo by voting for him through the StarStruck text messaging portal. Cielo's victory is well-celebrated, not only by his television fans nationwide, but mostly by his provincemates. In fact, the Provincial Government has passed a resolution naming him as "Mountain Province's Ambassador for Tourism." Tourism Regional Director Purificacion Molintas, meanwhile, said Cielo would be tapped as an endorser for the Cordilleras. "He (Cielo) should be invited to other festivals in the region," he said. Aside from the Lang-ay Festival, Mountain Province is also hosting this year's Cordillera Administrative Region Athletic Association (Caraa) meet, which is scheduled from April 1-6. Pagtielan said the province has prepared enough for this regional sports meet. "We are ready to accommodate tourists that would visit the province," he said, adding that even the educational institutions in their province were tapped to provide accommodation to visitors. Note: to supplement the photos of Lang-ay 2006 at http://tibaldoarts.tripod.com, I have hereunder posted the speech of Edwin Abeya who was the guest of honor and speaker in Bontoc on the occassion of the 2nd Lang-ay Festival. Thanks Edwin. The Honorable Under-Secretary to the President for Political Affairs Madame Josephine Dominguez, the Honorable Governor Maximo Dalog, the Honorable Vice-Governor Benjamin Dominguez, to the Board Members of the Mountain Province, to the mayors of the municipalities and their respective councilors, distinguished and honored guests, and most importantly to our dear children, ladies and gentlemen. Iyaman pay ken dakayo am-in tay dalos kayo in-mimbitar sinan nay ma-ikadwa ay “Lang-ay” nan umili. Gawigawis nan pabuya yo. Talaga met ay in pa-e-la yon nan kinadum-duma nan cultura tako ay Igorot. I am truly honored and blessed to be a part of this historic occasion. Ammok ay naban-nog kayo ya kayat yo et ay men palam-mi-is. Inbagan gedan si innak ay adiyak ando-andowen nan speech ko. Et surotek baw nan bilin nan ina-tako. Ngem kadya abes ta ibingay ko nan inad-adal ko isnan tapina ay il-ili ay in-inmeyak. Wada kami idwani ad Estados Unidos. Inmali kami ay maki-langay ulay no ada-adawi nan kawad mi tay mamati kami ay sin-asawa ay no egay kami din-makkel sinan sursuro nan cultura ay Kaigorotan, et siguro aped kami namamata-an ay maiwed leng-ag na. Isnan kinma-anan mi sinan ili tako, napaneknekan mi ay ma-id kasin teken ay umnengan nan nemnem no baken nan mismo ay na-isiknan ya naka-ir-waman. Isnan biag mi isnan teken ay ili, na-amwan mi ay nan ka-i-imasan ay “chicken stew” ay kananda ad America, et nan met laeng “Pinikpikan” tako. Nan ka-imisan ay “wine”, et nan met laeng karkarwak ay tapey di kaigorotan. Nan “music” ay talaga ay man-ipa-tayaw ay kaneg nan Eagle ay kananda, et nan met laeng gangsa ya tambol nan Montanyosa! Boy-boya-en mi nan American Idol Show id America ngem wada met gayam nan maymaymayat ay pabuya yo isna ay kanan da ay “Starstruck” – et si pay laeng Marky Cadaweng Ceilo ay Igorot nan nangabak. This year, the theme of our Langay-2 is “It is only in looking back in time that we are able to prosper towards tomorrow.” At first glance, the theme sounds contradictory. How can we achieve progress if our focus is in “looking back”. Didn’t we learn in school that we should look forward? That we should never look back? But as I ponder at whatever success I have achieved, I can see the merit of this theme. Let me explain. Ad Amelika, ado ado agpayso nan ipugao. Ngem no sabatem da ida sinan kalsa, ma-id pay mangwani en “Ay Sik-a Sa. Intako men-kape”? Menkakamo amin nan ipugao et maiwed tiempo is men-ag-ag-kongan nan sin pamilya. Ken datako ay na-igorotan, dinmakkel tako ay nan centro tako et nan pamilya. Because of this, napigsa nan panang isakit tako isnan ka-kabsat tako, gagayem tako, ya kailian tako. Sia nan essa ay Igorot value tako that we have practiced in the past and continue to practice in the future. Et wada nan naka ila-an tona. Issan sinaludsud da si Marky Ceilo no apay nga sinmek na ay maki-contest isnan Star Struck, kanana iman ay sumungbat ay “Para makatulong sa pamilya”. Gawis abes tay itultuloy tako nan sagni, nan gangsa ya nan og-gayam tako. Sapay koma ta adi tako liw-liwayan ay mang-isuro sinan anan-ak tako nan ikkan ay managni ya nan men-gangsa. Tay no malipatan wenno mam-mid nan gangsa ya nan sagni ken og-gayam sinan biag tako ay Igolot, et menbalin tako ay tribo ay ma-iwed leng-ag na. Ado ado gedan nan gawis ay ugali nan Kaigorotan ay masapul itultuloy tako. Nan panag-tulong kag nan ob-ob-fo, nan gaget, nan anos, nan panag respito isnan iyon-a, ya nan inin-a ya amam-a tako, ya nan panang serbi tako isnan kailyan. When we think of the word Lang-ay, the first thing that comes to our mind is the sharing of food. But as one of my friends said, “The great challenge to all of us, especially our elected and appointed officials and the leaders of the community, is to live in the true spirit of Lang-ay which means – SHARING not only in terms of food but more so in terms of sharing our core Igorot values. Hence, mai-wed koma mangbuk-bukod is gawis. And to quote another friend, “Greed and selfishness should be scorned and our leaders should trailblaze the way to elevate our province as the number one model against graft and corruption.” Gawis tay ipangpangulon Apo Governador Dalog datako ay mang celebrar isnan mak-wani ay Lang-ay. Makigad tako et ay mang-abolot ya mang practice sinan true essence of Lang-ay especially in our leadership capacities tas-ay ma-iwed kadilawan tako ay sin-pangili. Datako abes ay umili, ipakat tako abes nan kaba-elan tako ta ma-iwed maka-ibaga ay kulang nan gaget tako. Here and abroad, we are disappointed and frustrated when we hear about Igorots begging while displaying our basic Igorot symbols – the gongs, the Igorot attire and our Igorot dances. Even though the Igorots who are doing this represent less than 1% of the entire Igorot population, it does bring a bad image to the Igorot culture. I know that all of us have in one way or another tried to stop this begging but perhaps there is a deeper cause – something that we as a people will have to look into. Ado ado nan in-maddawi sinan ili tako et egay da nalipatan ay mangipawit is olay iman akit. Nagaget da ay men-obla. Wada pay nan organization da ay sinapo da ay makwani ay Igorot Global Organization (IGO, for short). 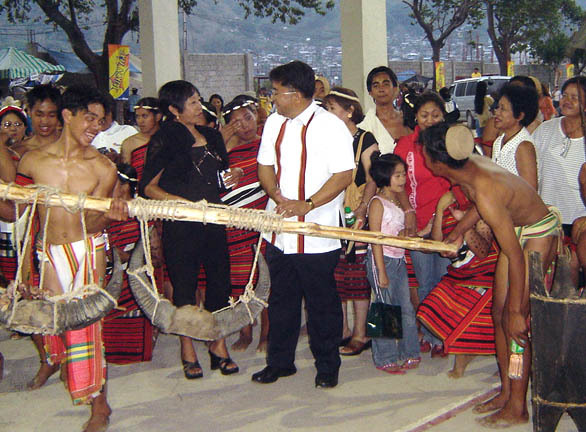 The goal of this organization is for the advancement and preservation of our Igorot culture. As a matter fact, the 6th Igorot International Consultation (IIC) will be held in Melbourne, Australia on April 19 to April 23. Ms. Paz Awingan Aptimes, the chair of the planning committee for this consultation and IGO Chairman and President Mr. Ray Baguilat extend their invitation to all of you to join them at the IIC. These consultations are a time for Igorots from all over the world to discuss issues and concerns that are affecting the Igorots here and abroad. We continue to look for ways to help our kailians. As an example, we will be implementing this school year the IGO Scholarship Program where deserving students will be provided scholarship to pursue their college education at our Cordillera state universities. At these IICs, we also showcase our Igorot cultural songs, dances, and our hand-woven, hand-crafted materials. We also have a BIBAKnet an email group composed of over 500 members, mostly Igorots, who have set up scholarship programs helping students to graduate from technical courses so that they can be gainfully employed upon graduation. The 7th IIC will be held here in the Philippines in 2008. I believe the venue will be in Banawe. I suggest for the next IIC meeting in the Philippines, that is, after Banawe, we should invite them to hold it here in Bontoc to coincide with our annual Lang-ay celebration. On the next Lang-ay – 2007, I ask the leadership of the Mountain Province to invite the Igorots who are overseas to come home and truly participate in the Langay celebration. We want them to truly experience the best of what Mountain Province has to offer. We want them to bring their money and spend as much as they can in buying our local products and produce. Just to share with you what I just learned. There are about 8 million Filipinos living abroad. In 2005, they sent $25 billion to the Philippines. That is a lot of money. There are a lot of us from the Mountain Province who have gone overseas to work. I would like to think that a big chunk of that money is being received and spent here for the betterment of our Mountain Province. Let us make our kailians who have gone overseas to work to become true partners in our Lang-ay celebration. . I am not suggesting that you have to go overseas to succeed. Far from it. As you very well know, there are a lot of you here who have become very successful in your own profession. If truth be told, we would rather stay home and work here and be close to our families than to be separated from them. To those who have “made it” here at home who are now working here in Bontoc, in Baguio, in Manila, or in other places in the Philippines, let us all team up to make Mountain Province Number ONE. Speaking of Number One, I understand that as a province, the Mountain Province is Class Number 4 out of 6 classes. I would disagree by saying that when it comes to the uniqueness of our Igorot culture, our songs, and dances, and our ug-ugali, we are Class Number 1. However, as to income, perhaps we are indeed Class number 4. And if that be the case, I have a challenge for you. Let us all work together – the officials of the Mountain Province, the community leaders, the church leaders, the business leaders, those who are overseas, and those who are here – to make Mountain Province number ONE by 2010. I mean number one with a Touch of Class. (Wad-ay nan inilak ay store assa ay nan ngadan na et Touch of Class. Aramadin tako et nan Mountain Province ay “The Province With A Touch Of Class”. In this world of globalization ay kanan da, masapul ay makicompetensia tako. Adi tako koma umigyat isnan competition. Let us welcome competition. Looking at the quality of products you have displayed, I know we can be competitive. But we have to unite. We have to have our local and national governments, our local business chamber of commerce if we have one, and our community leaders to help us. I know we have great schools here in the Mountain Province. I know this because I am a product of one. But we must continue to improve. Together, we can make our Mountain Province the preferred choice in which to raise our families, to send our children to school, to work in, to live in, and to retire to. Together, as we share our time, talent, and treasure, we will unleash our potential and by 2010, we will be a Class One province in the Philippines not only in terms of culture but in terms of all categories. This is the true essence of Lang-ay and this is my vision for our dear Mountain Province. (Sing this one). Et Sik-a ay Kabunian ay Adi ka-ila, ay nang-ga-eb sinan intero ay batawa, Sik-a ay tanga-den am-in di kaipu-ipugaw sinan luta. Men-iyaman kami ken Sik-a. Sik-a met laeng nan mangcompleto isnan "Lang-ay" mi ay kananda. Nan leng-ag mo koma nan mabati isnan ili ya nan ba-onen nan am-in ay bisita mi. Gawis ay Mountain Province! Matago tago nan Igorot! !